Easton’s Beach is a beach of many names. You may also have heard it called First Beach or Newport Beach. But whatever its name is, the beach can be found on the strip of land on Easton’s Bay that connects the peninsula named Easton’s Point in Middletown with Newport, where the Breakers and Marble House stand. Just like the ferry that runs from Providence to Newport today, steamboats going from Providence to Newport allowed access to Easton’s Beach (and such steamboats provided access to other beaches mentioned in this Rhode Tour). 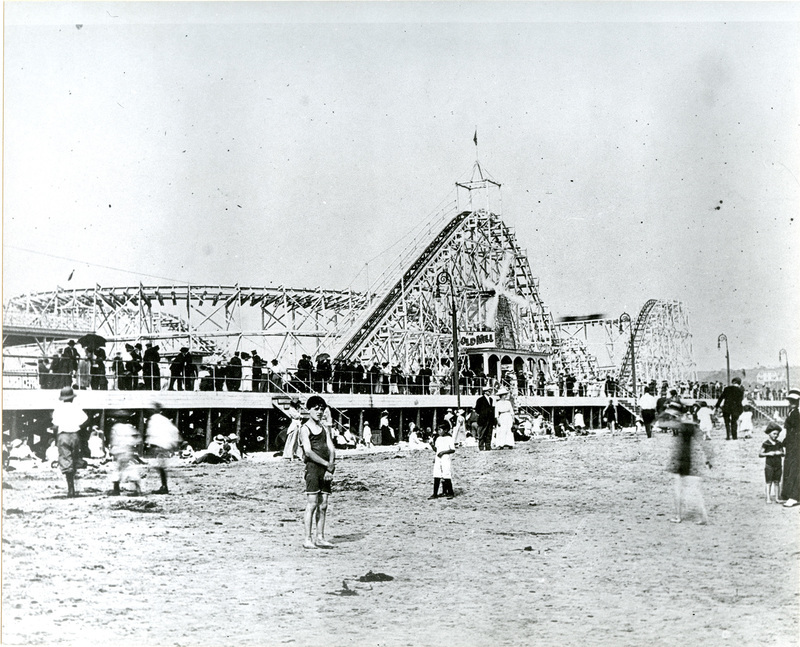 And like the other beaches on this tour, Easton’s Beach had amusement park rides including a carousel that the 1938 hurricane wiped away. The current carousel at Easton’s Beach is from 1958. Newport as a coastal city was exceptionally vulnerable, and nearby areas experienced severe damage. A 1920s real estate brochure shows us that Easton’s Beach was equipped with the amenities necessary for any beach town. 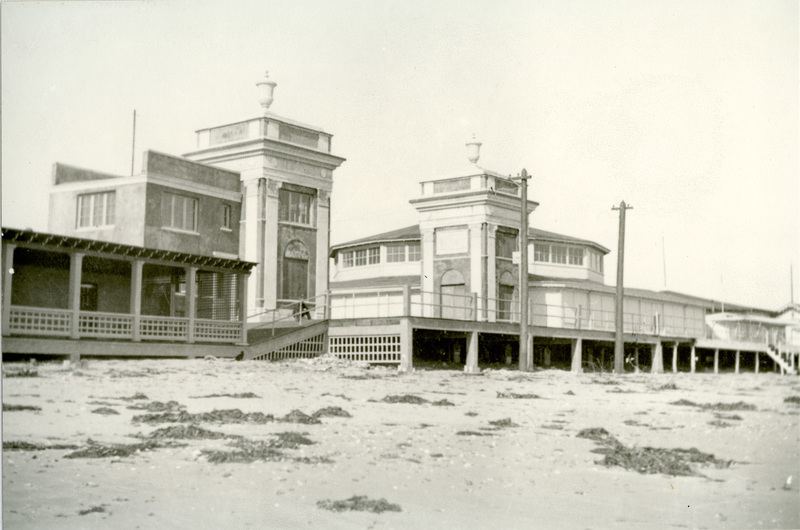 Easton’s Beach was close to cottages, a park, the cliff walk, and nearby on Easton’s Point was a clambake club, which still exists to this day. Families could rent swimsuits and cabins when they came to visit, making Easton’s an easy trip in the summer. There was also a boardwalk at Easton’s. 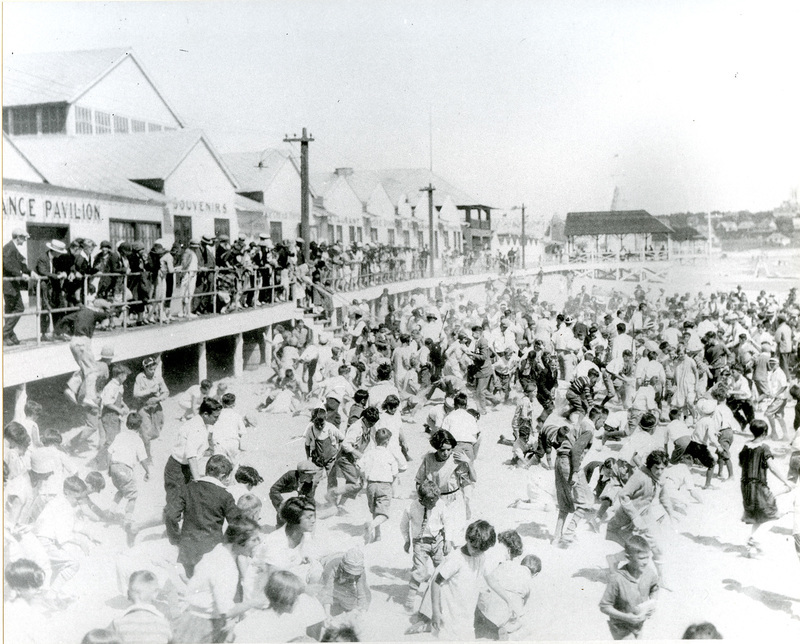 The quick steamboat trip mentioned above along with these amenities allowed Easton’s Beach to give families and individuals the perfect summer’s day experience with few inconveniences. 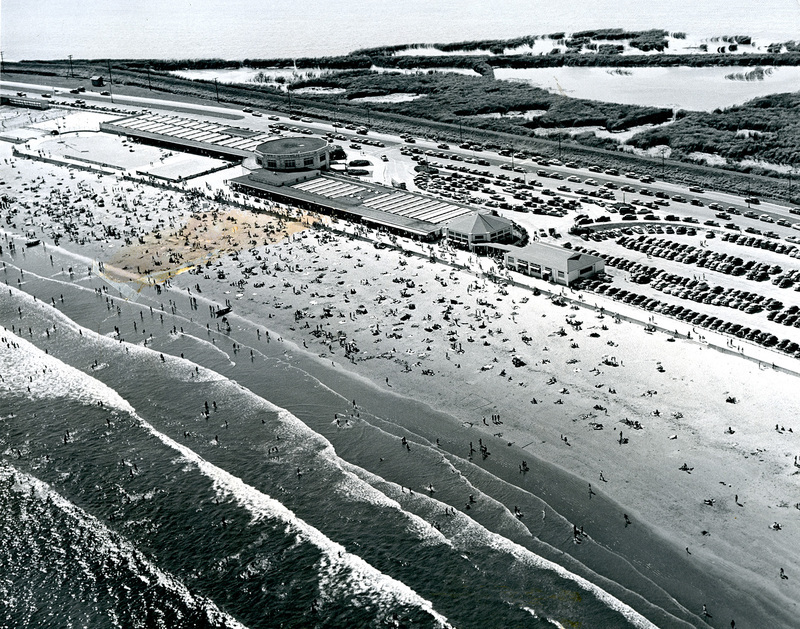 Today, Easton’s Beach is still an iconic part of Newport. Visitors to Easton’s can ride the carousel, eat at food stands and restaurants, surf, and even visit an aquarium run by Save the Bay. The location of Easton’s Beach within Newport is important to understand the history of the beach. Newport is best known for its luxurious Gilded Age mansions and the wealthy families who owned them, but it also was a coastal city people could visit for rest, relaxation, and entertainment. 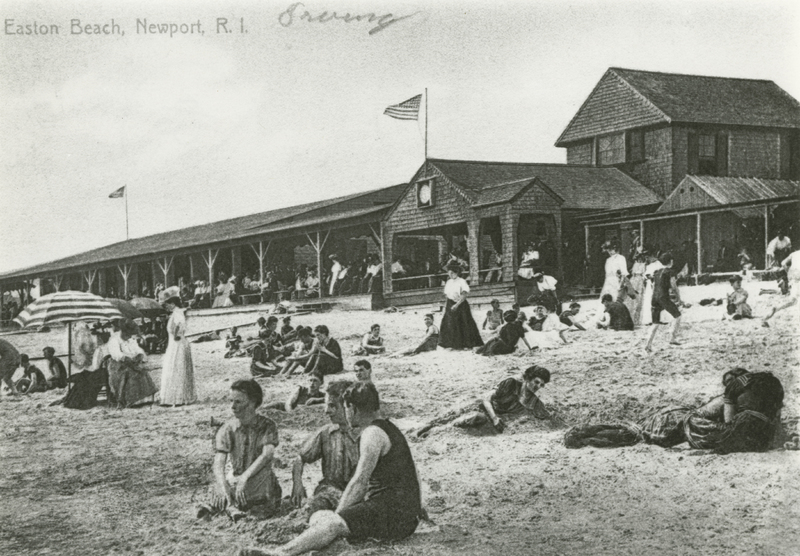 Families living in Newport were of notorious wealth, and class is quite apparent in the surrounding buildings and centers by Easton’s Beach, especially the exclusive clambake club or yacht club. Many of these still exist today. But despite the wealth all around Newport, much like at Watch Hill, Easton’s Beach was a public beach that was surprisingly accessible. 175 Memorial Blvd, Newport, RI 02840 ~ The beach is public but you must pay to park in the beach’s lot. Learn about Narragansett Bay’s sealife and ecosystem by visiting the Save the Bay aquarium while you are here. If you’re planning on spending the day at Easton’s, it’s easiest to park just in the lot at the beach and pay for parking. If you’re only staying for two hours or so and don’t mind a bit of a walk, there are lots of on-street free parking spots in town that you can walk to the beach from. Janie Merrick, “A Day in Newport: Easton’s Beach,” Rhode Tour, accessed April 23, 2019, http://rhodetour.org/items/show/333.